Adobe's latest iOS app turns your photos into promotional (or inspirational) posters. Adobe is on a tear as we near the end of 2015, releasing a slew of new apps designed to help you be more creative in your photo- and video-editing projects. 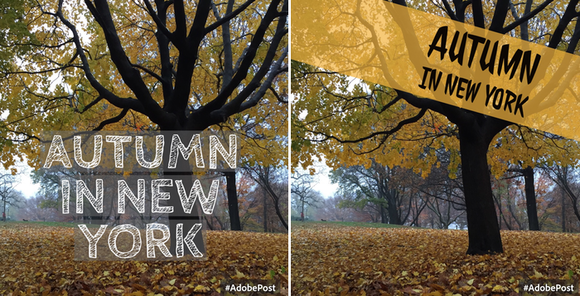 Its latest iOS app, Adobe Post, is an easy way to design Instagram-worthy graphics. That’s where Post comes in. Getting started is simple: Choose a base photo from your Camera Roll, search public domain photos, comb through your Lightroom or Creative Cloud libraries, or shoot a new image. To make it even easier on yourself, you can remix an image from the app’s inspiration board, which is separated into categories like seasonal, food, travel, and business. The inspiration board is filled with generic stock photos that can be easily personalized with design filters and text, like the one above. One irritating feature: Like some other free image-editing apps, Adobe Post watermarks your photo with a hashtag, as you can see in the photos above. The only way to remove that intrusive bit of text is by sharing Post with a friend. The good news: You only have to share the app with one friend to banish the watermark from all photos you create going forward. But a paid option would be appreciated, too. Annoying watermark aside, Adobe Post is a fun app that perfectly slots into the portfolio of social media-adjacent tools that give your photos extra oomph, like VSCO Cam, Instagram’s Layout, and Flipagram. Every aspect of your Post creation can be changed, even after you save it to your Camera Roll. And if you don’t want to change anything but the text, you can do that, too. Adobe is trying to capture the next generation of photo-editing geniuses by releasing visual storytelling tools like Post, the iPad app Slate, and the video-editing tool Voice. 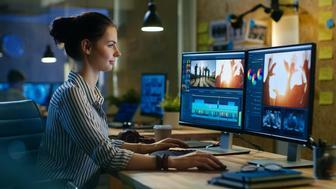 The most popular visual apps are Instagram, Facebook, and Snapchat, none of which offer the breadth and depth of editing tools that Adobe mastered long ago. 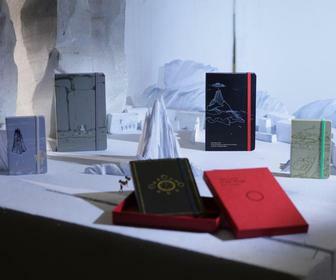 The company is smart to supplement those social networks with artsy apps like Post, which Adobe says was designed with millennials in mind, but will really appeal to everyone. Adobe Post is available in the App Store now for English-speaking iPhone users. Adobe is considering an iPad version down the line.